From clubs, festivals and corporate events, to session work, touring, and radio jingles, Catherine Loyer has a rich career in music. She is known for her electric presence and a voice that has power and control to spare. Catherine is backed by a top notch band, consisting of Jim Loyer on acoustic guitar, Toby Rapp on bass, Dennis Elmer on drums, Gabriel Trees on lead guitar, and Willow Welson on vocals. She and Strawberry Roan play an array of originals, artistic covers, as well as everyone's favorites. The songs range from country, to pop, roots rock, and even rock-n-blues. 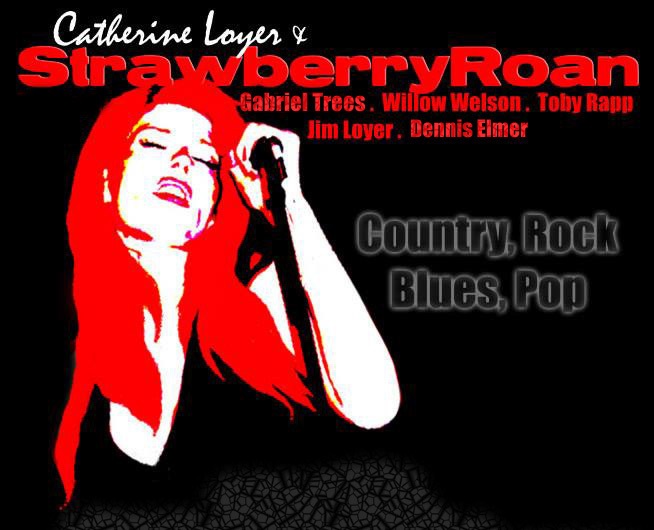 By adding their own personal slant, Catherine and each player create the distinctive sound, known as Strawberry Roan. With a busy gig schedule, Catherine and Strawberry Roan plays on, creating fans wherever they perform.